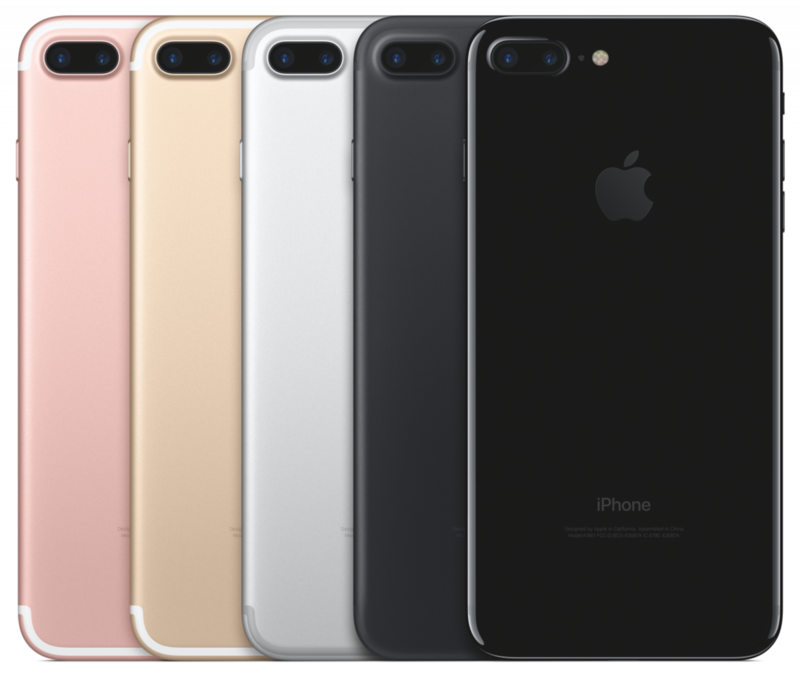 Thanks to our oddly monopolistic yet somehow still-competitive quad-carrier setup in the U.S. (AT&T, Sprint, T-Mobile, and Verizon have about 95 percent of the U.S. cellular market share), AT&T and Verizon are offering an amazing trade-in promotion for a new iPhone 7 purchase (Update: Apparently, John King said his experience with his T-Mobile trade-in offer was even better. Ask when you get into your carrier about current promotions). On any normal day, a trade-in deal is a great way to get the absolute worst value for your phone. But remember, this is your lucky ticket day. AT&T and Verizon are offering $650 (not “up to $650,” but actually and exactly $650) in credit toward your iPhone 7 purchase with the trade-in of any iPhone 6, 6 Plus, 6S, or 6S Plus in good working order, with the screen intact, etc. I cannot speak to the Verizon program’s claims, as I haven’t gone through the process yet. But I have spent plenty of time with AT&T support to verify this deal is legitimate. Therefore, the AT&T deal is what I will detail below. Verizon customers: check with a Verizon representative about their offer. Everything I have researched makes it appear to be an almost identical program to AT&T's. 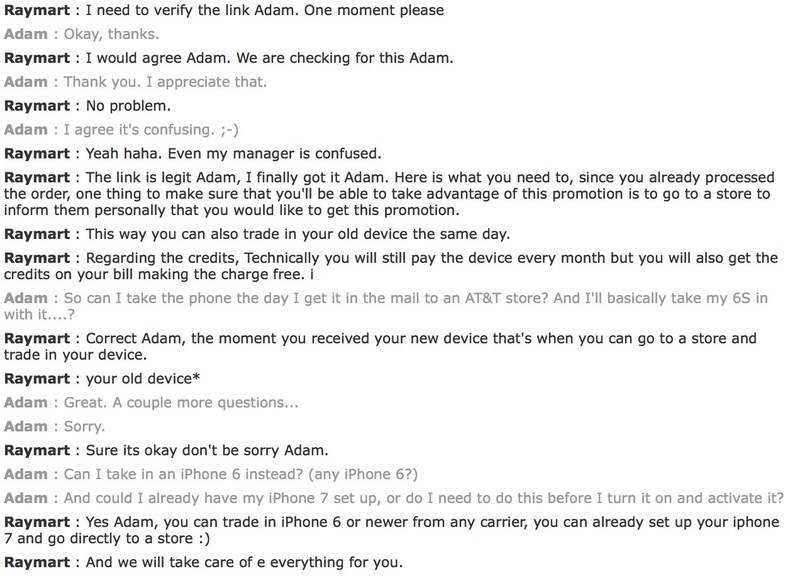 Here's a lovely sample of part of the chat transcript with AT&T support that verified this offer is legitimate. There are, of course, a few caveats with how you have to set this up. I’ll cover those right away, but bear in mind that the value of this deal outweighs any of these caveats; and in many cases, there’s a way around it. 1.) First, you need to have a fairly recently released iPhone in good working order to trade in. Anything that’s the iPhone 6 model and up will work. But current iPhone SE and iPhone 5 and earlier owners, you can get around this with the same process some of us iPhone 6 and 6S users will use — read on! 2.) You’ll need to be out of your contract and therefore be free to sign a new one (there’s a way to make this worthwhile, but no way to get around signing a new two-year contract that keeps you with that company). UPDATE: You still need to be out of any current contract commitments, but supposedly, you actually do not need to sign a new contract. I am skeptical of this, but read the update below for more. This is now confirmed. I did it -- worked perfectly. 3.) You have to use AT&T Next as a payment option. This is, in fact, a blessing, as you automatically get to finance your phone and keep that major chunk of cash in the bank while you slowly pay off your phone over time. But moreover — remember — you won’t really be paying anything (almost). Read on for details. 5.) 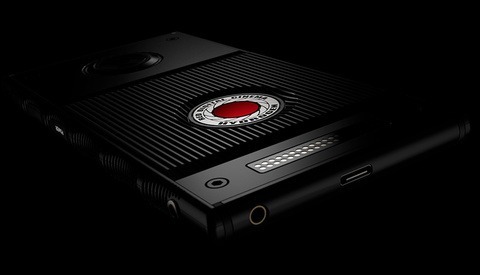 Finally (this could easily be Number 1), you’ll need to actually want the iPhone 7. 1.) If you don’t have an iPhone 6 or newer/better, you can easily go buy one in good condition for as little as $300. 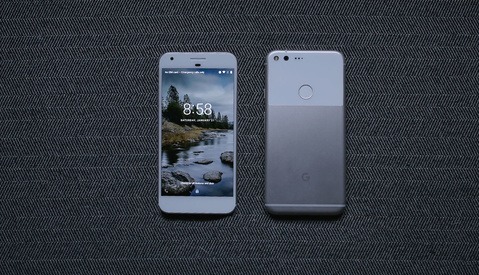 In fact, for anyone that doesn’t have a low-end iPhone 6, you should just go out and procure such a phone to have for your trade-in so you can keep your current phone to sell, as it could be of a greater value to you than that used 16GB iPhone 6 you can now get for about $300 on sites such as eBay and Craigslist (always be safe online and out in the world for any purchases you make). Sorry for the lack of contrast in my transcript. But we can thank Raymart for clarifying this for us. 2.) My sister, for example, has a contract that expires this November. However, this deal still works in her favor if she’s willing to spend some money up front (what follows may or may not apply to you — ask your AT&T rep). She can cancel her contract for a rather steep $105, but that will discount her monthly line access charge by $25 per month right away, which will save her $50 between now and November, which is when she’d normally be eligible for that discount at the end of her contract. This means it’s a $55 charge to cut her contract now and take advantage of this deal while it lasts. The benefits of all of this far outweigh this small charge. 3.) AT&T Next sounds complicated and scary, but it’s really not. 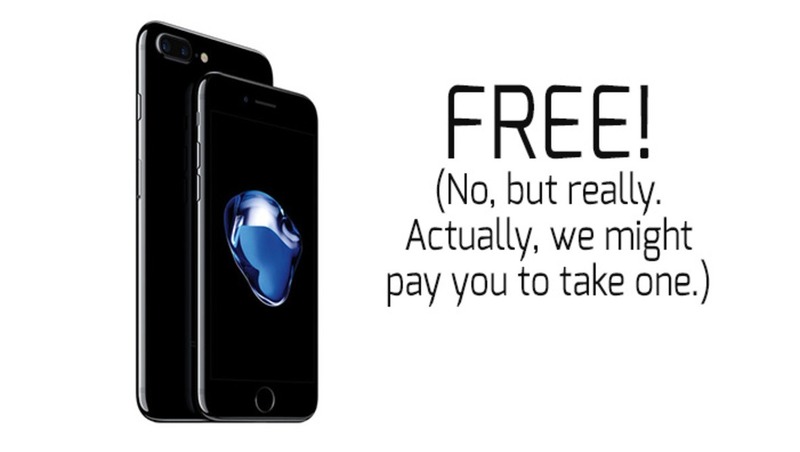 In truth, it’s simply an interest-free loan for a new iPhone that you pay off over time on your bill every month. No one should be paying outright for their phone unless they want their phone unlocked for easier and cheaper global service. But even then, you’ll want AT&T Next (you can pay off the entirety of your phone at any time you wish, at which point you can get your phone unlocked right away — so travelers: you, too, can and should take advantage of this deal). 4.) Okay, okay. This one you can’t get around. Unless you live in a sales-tax-free state, you will be paying something. Whether it’s the up-front payment of the tax on your device (Uncle Sam’s generous donation still applies) or the difference between the $650 credit and the cost of the iPhone 7 model you actually want to purchase, you’ll be paying something to get those new camera features (that’s why we’re here, right?). But at the end of the day, no one else is going to give you more than or even up to $650 for your phone right now; and waiting for your phone to depreciate another $100-$200 while you pass this deal up isn’t a great idea, financially, unless you literally never plan on upgrading. The going rate for my 128GB iPhone 6S is, at most, $550 on Craigslist. It could easily be even lower since Apple now made it just $100 more for a brand new version of that phone with a full warranty. 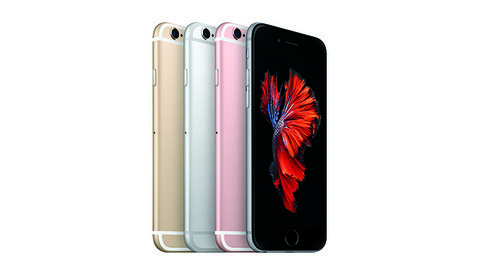 The only more expensive iPhone is the 128GB iPhone 6S Plus, which might get you $650 if you’re lucky. But this is all forgetting the best way to do this. Remember Number 1… Keep your current phone if it’s a nicer model and go get yourself a bottom-of-the-line iPhone 6 that works well. 5.) Spoiler Alert: The iPhone 7 doesn’t have a standard audio jack. Shocker! Oh, Lee Morris already told you? Well, he’s right — sort of. No, the iPhone 7 doesn’t have an audio jack, but progress rarely comes without a beginning sacrifice. The truth is, wireless audio is the way to go. Yes, Apple missed a huge opportunity to create and announce a new wireless standard or some kind of Bluetooth magic that made Bluetooth audio sound as good as plugging in. But at the end of the day, unless you’re going to leave the iPhone as a product behind forever, we’re all going to need to get used to this eventually. Apple won’t back down from this for the next iPhones, either. So with that, stop complaining, use a dongle for a while, and take advantage of a deal that makes financial sense. By the way, as gorgeous as the Jet Black color is in photos, do remember that it's supposed to show micro-abrasions quite easily. I wouldn't trust it to remain free of fingerprints, either. And if you have to put a case on it to protect the phone from both of these issues, what's the point in getting the Jet Black? So I still haven’t really explained how this works, but below, let’s go through the specifics of what I’m doing to cash in on this offer. This situation is specific to me, but anyone can do this. A broader outline will follow. I’m on AT&T, and my contract expired (the 12th of September). That’s convenient. But again, this could still be financially sound depending on where you are in your contract. I have a 128GB iPhone 6S that my iPhone 7 will be replacing, but I’ll be saving it and will find a cheaper iPhone 6 to trade in instead. Once I buy a 16GB iPhone 6 for about $300 on Craigslist and sell my current iPhone for about $500-550, I’ll be up at least $200. Pause. Note we’re at a $200 credit at the moment. That’s because I have a really nice phone to begin with. You may not be in that position, but we’re going to stick here for a moment and settle up at the end. Continue. That iPhone will get me a $650 credit toward any iPhone 7 I want if I do it through AT&T Next. But I want an iPhone 7 with 256GB of storage. Normally, that phone would entail a monthly payment of $35.38 for 24 months. But AT&T will credit me $650 over those 24 months, bringing the payment down to a very affordable $8.30 each month. The math is kosher: my $200 upgrade on the $650 price is paid for by that $8.30/mo payment ($8.30 x 24 = $199.20 — I even save another 80 cents on the upgrade price). So at this point, I am paying AT&T $200 for my phone. Pause. Now that I’ll spend my $200 credit from my iPhone switch-a-roo game for the $200 upgrade to get the $256GB model, I’ll be at about a net cost of $0 (I suppose I’m making $0.80, actually), only now I have a brand new iPhone 7 with a massive amount of storage compared to my depreciating iPhone 6S. But I also have signed a new two-year contract that guarantees AT&T that I’ll stay with them (note that I can still change my plan with them; but I have to stay with them as a post-paid wireless customer for two years). So if you're planning on switching carriers soon, don't do this (or better yet, do it with Verizon if that's where you're going). Continue. I do, however, have to pay a $20 one-time upgrade fee to AT&T as well as sales tax on my device, which is $74.29 on the $849 256GB iPhone 7. That puts me at a deficit of $94.29 to trade my iPhone 6S for a brand new, under-warranty iPhone 7 with twice the storage. Here's how pricing works alongside current availability estimates. Ignore the monthly pricing...that's for Apple's slightly more costly iPhone Upgrade Program. That was my specific situation, but if you have my phone and want to keep the same storage, you would pay $100 less (while saving another $8.75 on tax in California), which would mean you could get a cappuccino with an extra shot and organic milk at a really nice coffee shop with your change. If your sales tax is less, if you have an even more expensive iPhone than mine, if you’re okay with an iPhone 7 with even less storage — in any of these situations, you end up on top. Let's say you still have an iPhone 4. First, I'm really sorry, but equally excited for you. You can still go out and get a $300 low-end iPhone 6, get a $650 credit toward an iPhone 7, and then sell your iPhone for slightly under $100 online. The net cost of a bit over $250 to you in exchange for jumping six generations of iPhones is remarkably good. But do yourself a favor and spend $100 more for four times the storage. Paying that off over those 24 months will only cost you $4.17 per month. If you’re a globe-trotter, you might want to have an unlocked iPhone. And if you do travel so much, you’re well-aware by now that the only way to do that is to pay for your entire device up front. However, you can actually choose an AT&T Next plan, take advantage of this great offer, and pay off that plan at any point in time in its entirety. At that point, AT&T will unlock your phone. You can therefore even wait to pay off your phone until your next trip. There’s no penalty for doing this whatsoever. You still have to keep your 24-month plan with AT&T in the United States. But you are free to take your SIM card out and insert a local one while traveling to save a buck on those outrageous international calling costs. Darn, I Already Ordered My iPhone 7! Don’t worry! An AT&T representative told me that I could walk in with my already-activated (or not) iPhone 7 when I get it, bring in any working iPhone 6, 6 Plus, 6S, or 6S Plus, and simply ask for the offer, and it would be honored once they verified the trade-in device was in good working order. This was verified with his manager and then again with that person’s manager. The deal was so good, they were all confused until they ran it up the chain. And it checks out. If need be, I even have the chat transcripts to take into the AT&T store. The best-case scenario is that you already have the super expensive 128GB iPhone 6S Plus. You then go and get yourself a cheap iPhone 6 for $300 for your trade-in device. Sell your giant drop-liability for about $600, and somehow be okay with getting a 32GB iPhone 7 for $649 plus tax, but then live in a state like Oregon that doesn’t have sales tax. Over time, AT&T pays even a dollar over your monthly fees whenever they come up, leaving you with the new phone and a $300 positive difference between the trade-in and the $600 you get from eventually selling your current phone. Apply that $300 to tax, a storage upgrade, an upgrade to the 7 Plus, your early contract termination fee, etc., to figure out your potential immediate net gains or losses. But no matter how you cut it, these are the best deals for new-release iPhones to come around in quite some time. Update: Your minimum plan cost must be $50 to take advantage of this deal. But I don't know of many iPhone/data plans that are less than that. There was obviously much more to this chat, but this is the gist of it. For those wondering, the $15 line access fee being referenced doesn't have to do with this offer, but is applicable to all AT&T phones. For some plans, that fee is higher. For mine, it happens to be $15. This would be there with or without the trade-in deal discussed in this post and is simply a way for AT&T to advertise lower plan prices, but still charge a little extra. Every carrier has these fees. They're all very similar. Update 3: T-Mobile (as John King mentioned in the comments below) and Sprint also have various trade-in offers worth exploring. I have an iPhone 6 with a grandfathered unlimited data plan on AT&T. I'm waiting this iPhone out but will upgrade next year. What in the hell do I have to do to get a new iPhone and not lose my unlimited data? I can't seem to get a clear answer anywhere. Just never change your data plan. You can adjust your talk time freely, but never, ever, ever touch your data settings in the AT&T app. Your contractual obligations through AT&T Next or your contract-free iPhone through Apple Upgrade don't affect your unlimited data status. I recently gave mine up to add an iPad to my account, but I actually saved $5 a month by changing from the old unlimited price point (and having to spend $20/mo for a few KB worth of text messages) to the new Mobile Share Value 5GB that has texts included for free. I would talk to AT&T. But none of this should change your grandfathered plan (unless AT&T doesn't let people on grandfathered plans into AT&T Next for some reason). Contrary to what many think, AT&T Next has nothing to do with plans or contracts other than requiring you to continue to use SOME type of AT&T post-paid plan while still paying off your phone. It is simply a payment plan. Whatever your cellular data plan is, you should be able to keep it. Adam, can we have your chat transcripts to take with us to the store as well? Unfortunately, I have some private account information elsewhere in the chats from time to time, but please let me know if you have any issues. You really shouldn't. One thing to note, however, is that it does help to have the AT&T article I linked to in the article above. Not everyone is aware of this yet; and the $650 price is easily confused with a similar "switcher" offer for people that are going to switch from another carrier to AT&T. The offers are not combinable. But if you're a current AT&T customer, you need to do this trade-in promotion and NOT the switcher offer, obviously. But some AT&T reps just don't know about it. So bring that link in with you. There's an included adapter...I don't understand. What he doesn't say is that any time you are in contract with att you are charged $25 per month per phone. So that equates to $600 over the life of the contract. iirc, they match $25 per month with a credit. I could be wrong though. I'll get back to you and will update the article once I have screenshots of the chat transcripts that say this (the emails of the chat transcripts seem to be a few minutes delayed, always). The "Bluetooth magic" that makes it sound better already exists. It's called AptX and Apple has continually refused to incorporate it into their bluetooth for some inexplicable reason. Though even with AptX you still don't get the same quality as a good pair of headphones plugged in. I only use my Bluetooth headphones for listening to podcasts. I was just going to say...even AptX isn't as good. I've used it plenty. I think this is why Apple has lagged with enabling/adding it with their iOS devices (but the newer-ish Macs have it) -- they don't like to implement half-baked solutions. But they really should have come up with their own, better, end-all-be-all solution for wireless audio. Thanks for letting us know of this deal, but the organization in this article is severely lacking. My head hurts from trying to keep up. That's awesome! I'll update with that experience. thank you for pointing this out. I hadn't see it in the promotions that I was sent. I ended going on ATT's site and linking up w/ a customer service person via their chat and they fully explained/confirmed the deal. I had been considering upgrading from my 6/32g anyway because my phone speaker is starting to go. Got the $650 for it (once I send it in). Got the 7s/128 because of the camera. Just paying the difference between 7/32 and the 7s/128. I have an old 3s (and a 4s for that matter) which has been cracked to use international cards so I don't need to keep my 6. Let's do some math here, because I was on an ATT contract for years and am happily on a prepaid Cricket plan now. Cricket is owned by ATT and uses their towers. Say I want to do this promotion. The lowest thing of value I can trade in is a 16gb iphone 6 worth ~$300 and in return I get $650 of bill credits. ATT is giving me $350 in credit over 2 years. $20 upgrade fee brings it down to $330. The 6GB per month plan with unlimited calls and texts on ATT is $80 a month plus taxes and fees. Mine were around $7.25 a month (depends on your state). So in the end I'm paying ~$87 a month for everything. $87 x 24 months = $2088. ATT is giving me $330 over these 2 years towards my iphone 7 so in the end I'm getting service and an iphone after trade in for $1758. The other option is to sell my $300 iphone 6 to someone on craigslist and then spend $350 out of my pocket on a 16gb iphone 7. I'm not including sales tax in either of these examples since that's a wash. Then I sign up for cricket's 5GB plan with unlimited talk and text plan which is $45 a month with auto pay including all taxes and fees. $45 x 24 = $1080 + $350 for the iphone = $1430 for an iphone 7 and service. Yes Cricket is 1 less GB of data per month, but unless you are using right up to your limit of 6GB each month, this isn't a big deal. You can always jump up to the higher plan for $10 a month prorated on Cricket which ends up being a couple bucks then switch back. Both plans will roll back to 2g if you go over too. So in the end, you can save $328 over 2 years ($1758 - $1430). This is basically like the old 2 year contracts all over again. They give you a price cut on a new phone as long as you stick around for 2 years. Before you had to pay an early termination fee to get out of the contract. Now you have to pay off the remainder of the phone's price. With pre paid if a better offer comes along 6 months from now, I can just switch over to it. From talking to a Verizon Rep yesterday, it appears that it is essentially the same deal at Verizon. Adam, thanks for posting this. I was able to take advantage of this offer this week. I did ask the AT&T rep one question that has me concerned if I were to upgrade next year...They are breaking the credit into equal credits over the life of the NEXT agreement. I asked her about upgrading next year and she said I would probably lose the remaining 12+ credits as I would be required to pay off the iPhone 7 at that time. I challenged her on it, but she was just a store rep towing the company line. Did you happen to inquire about this topic? I printed off the original offer link that you posted above that is no longer available and it did not mention that you would lose those credits if you went with NEXT Every Year. I'm filing it away in case I have to bring it back to their attention next year. If you find out anything, let us know. Thanks, James. I just looked into this further; and while it directly contradicts what three separate AT&T reps told me at first, supposedly this now seems to be true. I don't know the legality of how they can advertise even with the fine print and not mention that...it seems awfully shady to me. But of course, this seems to be the catch at the moment. I, too, have more questions and will keep asking. Hmmm. Adobe can probably learn something here. They offer cloud subscription. What is the value of that really? I mean if you can't afford that you could always use the raw converter that is for your camera then use Gimp. Sure LR and PS can make things faster for pros. But for enthusiasts or promateurs how do you sweeten the deal? Free camera body with a two year contract, Adobe follows all your social media accounts, even your dog's and if they see something decent that you're able to produce, they share it. Win - win. If they don't do this... Someone will. If I thought about it, someone else would too.